This article will tell how to allocate free space to C drive partition without formatting hard disk on Windows computer. 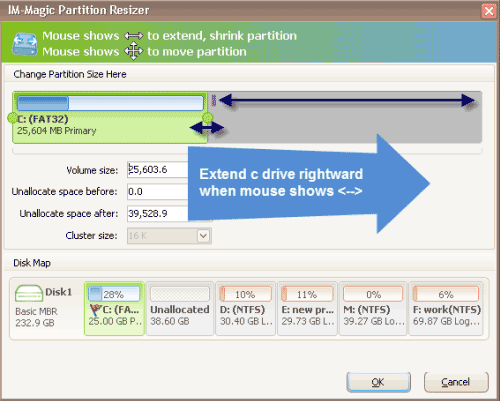 Download IM-Magic Partition Resizer Server to increase size of C drive by moving free space from other partition without formatting and repartitioning disk. Data can be stored to a partition when it has enough free space. When a partition does not have enough free space but you want to save data to it, you need to format the disk or delete files to free up disk space, or you need to repartition hard disk to reallocate disk space. Now, if you can use partition software IM-Magic Partition Resizer Server, you can reallocate disk space without formatting or repartitioning hard disk. By using this software, you can allocate free space to C drive system partition and any other partition that runs on low disk space. "My computer with Windows Server 2003 operating system is reporting low disk space warning message on C drive because it only has little free space left. I tried to perform disk cleanup and uninstall some unnecessary applications, but C drive still doesn't have sufficient free space. Is there any way to increase the size of C drive on Windows Server 2003?" "I want to move some free space from E drive to C drive on Windows 7, but somebody says that I need to repartition and reformat the hard disk so that I can reallocate disk space to C drive. Should I backup data first of all if I repartition the hard disk? Even if I can backup all important data, I don't know how to reparation a hard disk. Besides, if I repartition the hard disk, do I need to reinstall system? 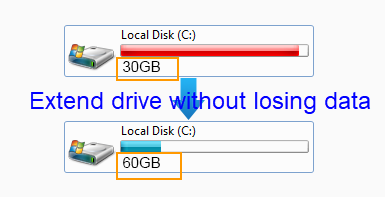 Is there any easy way to move free space from E drive to C drive?" You can reallocate disk space under Disk Management when C drive is running out of disk space on Windows 7, Windows Server 2008, etc. However, you must make sure there is unallocated space next to the C drive. You may also run Diskpart command on Windows Server 2003 to extend C drive, but Diskpart can only extend a data volume that has NTFS file system. If you failed to reallocate disk space to C drive by using Disk Management or Diskpart command, you can rely on partition software. IM-Magic Partition Resizer Server is designed for Windows Server users, which has the ability to increase the size of C drive on Windows Server 2003, 2008, 2012, SBS 2003/2008, Windows Server 2003 R2, Windows Server 2008 R2 and Windows Server 20312 R2, etc. This partition software can also work on Windows PC like Windows XP, Windows 7/8/Vista, etc. If you want to resize C drive on Windows XP/Vista/7/8, you can also run IM-Magic Partition Resizer Free. By using the partition software to reallocate free space to C drive, you have no need to repartition hard disk or reformat the disk. Usually, you need to repartition hard disk if you want to allocate free space to C drive. However, you need to reformat the hard disk in order to repartition the disk. In order to avoid data loss due to repartitioning and reformatting hard disk, you need to backup all data stored on the disk. If you can use the partition software, it helps you reallocate disk space and move free space from other partition to C drive so that you can extend C drive without formatting the hard disk. This partition software enables you to increase the size of C drive with original data untouched, so you even do not need to backup data before partition resizing.